Manhattan High School Assistant Principal Michael Dorst will be taking over as the new MHS principal later this year. 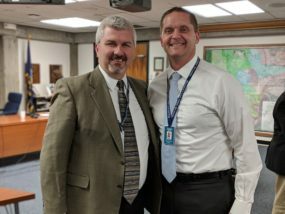 The announcement came from USD 383 Superintendent Marvin Wade during last night’s board of education meeting. Dorst was chosen from a pool of five candidates. Dorst says he was drawn to the position since he has been at MHS for 11 years and has worked closely with current MHS Principal Greg Hoyt. He wants to use the skills and abilities he has grown to make an impact at the school in a big way. When asked about his goals, Dorst says he doesn’t want to make major changes per say, but to focus on taking what the administration is already doing and being more efficient at it. Looking forward towards his first year as principal, Dorst wants to expand on Hoyt’s efforts to push the school out of its comfort zone. He says there isn’t a list of changes or goals he has specifically, just more efficient ways of doing things. Before the meeting, Dorst spoke with Hoyt about the position. Hoyt told him to make sure to accept help and find ways to support the people who will help him. Dorst will take over the position when Hoyt retires on July 1st.